After looking at some rather dramatic reports on the news, a visit to Turkey may have moved down a few notches on your travel planning short-list. But maybe you should reconsider, or adjust that thought. Cappadocia Turkey is an island of calm sitting in the very center of Turkey. The lunar-like landscape dotted with jutting rock formations is like nothing you have seen before. There are a huge array of outdoor activities and cultural sites to satisfy the needs of every traveler. 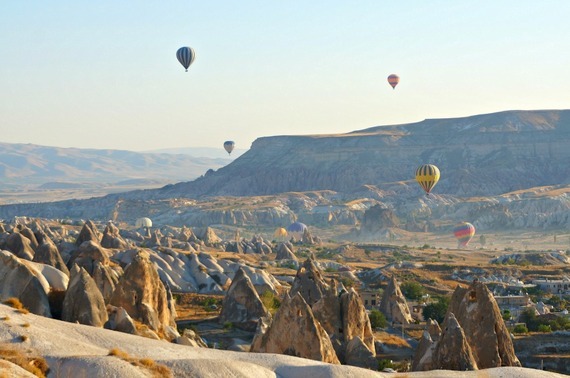 Here are six reasons that will convince you that Cappadocia should be on your radar. Cappadocia, particularly in the Göreme region, is known for its fairy chimneys. These pillar-shaped rock formations are the result of millions of years of volcanic activity followed by massive erosion. The resulting landscape, which is mostly barren scrubland clustered with the tall chimneys is a jaw-dropping sight. Many of the fairy chimneys have been hollowed out over the years, and now serve as homes and in some cases restaurants, bars and hotels. Where else can you sleep in a cave suite hotel in an exotic locale (and without breaking the bank)? And after you have slept inside one, the next best way to enjoy a fairy chimney is from above, on a hot air balloon ride. Every morning, if the conditions are right, the skies around Cappadocia are decorated with dozens of colorful hot air balloons. 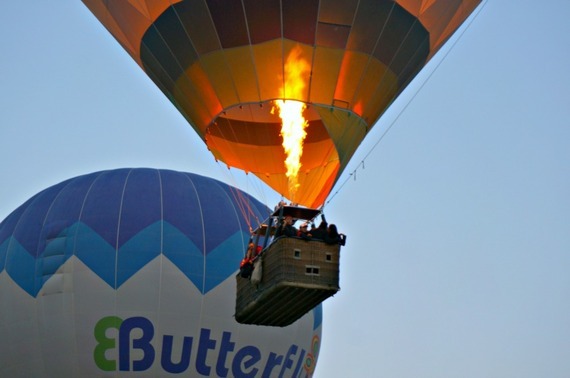 This is a favorite activity in the area particularly because the pilots are able to give you a close up view of the fairy chimneys, often nearly brushing the rock formation with the balloon baskets. Imagine a morning watching the sun rise and then passing through a forest of stone fairy chimneys? Pure magic! If the idea of flying in a hot air balloon doesn't float your boat, because you are all the happier with your boots on the ground, Cappadocia still has a lot to offer. There are several hikes through the area where you can get a good up close view of the fairy chimneys and a glimpse into life as it has evolved here over thousands of years. A visit to the Geröme Outdoor Museum offers the opportunity to wander through a historic community built inside the rock formations. Remnants of colorful frescos are still visible some of the cave walls. And if you want to delve even deeper, maybe your best plan is to explore Cappadocia -- underground. If you were able to do a cross-section below the surface, Cappadocia would resemble an ant farm. There are over 200 underground cities built hundreds of years ago. The largest underground city housed an estimated 20,000 inhabitants at a time. These cities were most heavily used by Christians hiding from their Roman persecutors in the 2nd and 3rd centuries. Some are now open for public exploration. You can travel down narrow passageways (some reaching 8 stories below the surface) and wonder what it may have been like to be sealed there in hiding for up to six months at a time with 20,000 frightened friends and family members. The thought is as chilling as the air inside the caves. Cappadocia is home to six wine making regions, all with their own character and style. Since the Turks have been making wine since 4000 B.C., you'd think that they probably have gotten it right by now. There are several operators who offer wine tasting tours. Alternatively, you can spend an evening in a chilled back lounge sampling the local wine. And while you're at it, you might also enjoy another popular activity in Cappadocia's bar scene -- smoking a shisha. The shisha (or hookah) water pipe is brought to the table with embers of a substance made of tobacco and fermented fruit. And don't be in a hurry, smoking the pipe should take between one and two hours. But when you're on vacation, who is in a hurry anyway? After a long day of taking in the sights, you are sitting at dinner, watching the fire glowing in a wood fired oven. 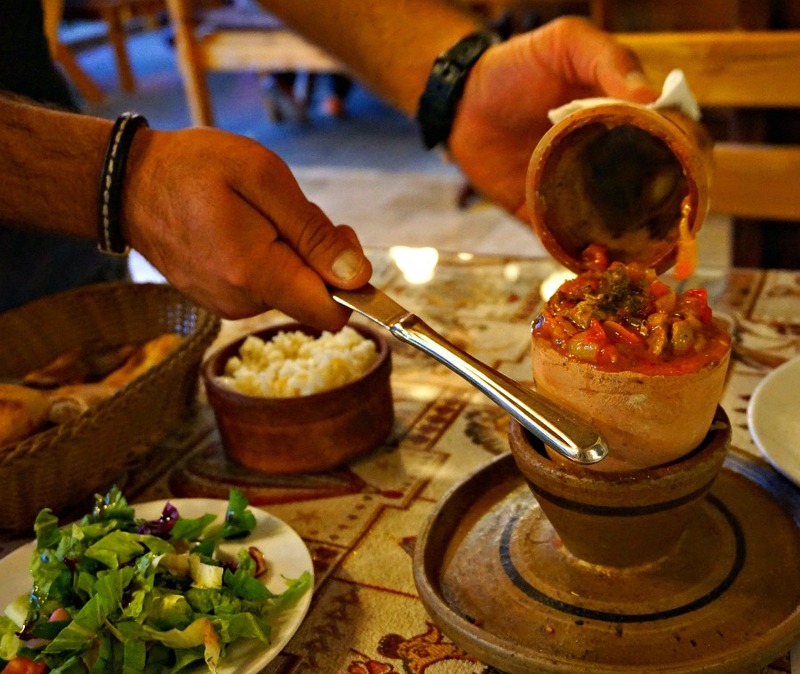 Finally, your dinner is ready and the waiter pulls a clay pot from the fire and brings it over to your table. He ceremoniously cracks the side revealing a steaming fragrant stew with meat and vegetables. He brings out an assortment of sides, including fresh-baked bread, green salad, slow cooked beans, and yogurt sauce. And you realize, when you decided to take a trip to Cappadocia, it was pure genius. You can visit the area any time of year. But be aware of the heat and crowds in the summer months and cold temperatures and snow in the region during the winter. Spring and fall, when the climate is mildest, are probably your best bet. And if you do go, spend more than a day or two (as most visitors do) to truly enjoy and savor all Cappadocia has to offer.